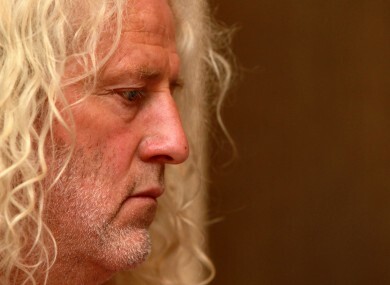 INDEPENDENT TD MICK Wallace said the response he has been getting from the public following his passionate speech in the Dáil this week has been unbelievable. Speaking on RTE’s Marian Finucane radio programme, Wallace said he was “delighted” that Micheál Martin had “picked up the baton” on the gardaí allegations, stating that because he is the main leader of opposition and “he does carry more weight than we do”. However, Wallace added that if it wasn’t for the independent opposition, the issues surrounding the gardaí would have been “buried a long time ago” and it would not have been heard of again, he said. Since this week’s publicity, he said they had another 12 people come forward with allegations. “I’ve heard so many people cry now, it really is heartbreaking stuff,” said Wallace. He commended GSOC stating that “it is actuality a pretty good organisation” but said that they are not giving the powers they need to do their job properly. Wallace raised the issue of the Roma children controversy, stating that the it was “blindly obvious” that GSOC should be able to investigate allegations of racial profiling, “but instead he [Minister Shatter] gave it to Children’s Ombudsman… “. He added that in past reports by GSOC, they have “begged for access to pulse – independent access, up to now they have only had access to it via a garda, they bring in a garda to show it to them – this is an unsatisfactory arrangement,” he said. He criticised that they were only given access recently in what he said was because of “political pressure” and “not because it was the right thing to do”. However, the Wexford TD was highly critical of the Minister for Justice, Alan Shatter stating that while he was not saying that the minister had not done anything to investigate issues highlighted recently, he said that throughout the whole process, issues had been “rubbished” by the minister. He admitted also that he was not stating that all the allegations being made and people coming forward were accurate in their reports, but said that allegations of wrong doing should be investigated. He was critical also of the inquiry into the controversies, stating “…We are looking at half baked inquiries” and he called on the judge, who has been charged with carrying out the inquiry, to be given the “proper powers”. “It is unfair to the judge to put him in that position where he cannot fully investigate first principles… We are back to more report into reports, its back to paper review,” said Wallace. He criticised the narrow terms of reference the judge had been given stating that the judge cannot go outside them. “Only the minister can let him go outside them,” he said. Wallace was also critical of the close links, as he saw it, between the Garda Commissioner Martin Callinan and Minister Alan Shatter, stating that there should be a buffer between the two. He said he believed the minister was protecting the commissioner. He concluded by stating that trust and transparency in the gardaí was of vital importance, adding that the recent controversies had been extremely damaging. Email “Wallace: 'I've heard so many people cry now, it really is heartbreaking stuff'”. Feedback on “Wallace: 'I've heard so many people cry now, it really is heartbreaking stuff'”.